We will be running the Masters competition on Saturday the 8th of April to coincide with the Saturday of the real Masters from Augusta. The tee times are from 4.32pm to 6.32pm, we invite you afterwards to watch the real thing on the big screens in the bar. The cost will be the usual £13.50 which will also include a free Heineken. 1st prize – The Callaway Odyssey works 2-ball putter + the all-important green jacket. 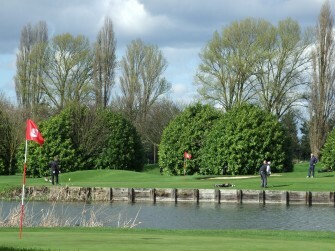 2nd prize – A game of golf at Dukes for 4 people including lunch anytime. 3rd prize – A ten token range card. Last place – ½ hour video golf lesson including balls with PGA Pro Ben Schrevel. Nearest pin prize on the 1st : for a £10 entry on the day we have the “Be Good” hole in one challenge for Cancer Research. This competition will be on over the weekend (7th, 8th and 9th April). If you get a hole in one then you win £1000 straight away. You will also win a luxury golf day out with 18 holes of golf including lunch. At the end of that day you will play a nearest pin challenge against up to 2 other hole in one winners to win an Audi A1 car. Anyone who hits the first green having entered the challenge wins either a glove or a 3 ball sleeve. If nobody gets a hole in one then the nearest will win a bottle of champagne. This is for a great cause Cancer Research and £5 will go to them for every entrant. Furthest from the pin on the 1st: A bottle of something strong to drown your sorrows away. Nearest pin prize on the 9th : for a £1 entry on the day in aid of the Tommy Hollis Children’s Fund we have a box of 12 Titleist Pro V1X golf balls. This is the charity we all put money in every week for and every £1 goes to them. Best gross score : A Callaway cap + sleeve of Callaway Chrome soft balls. We will be using the Dukes Meadows handicaps for the competition. If you do not have one yet then just hand 2 signed scorecards in to the Pro shop and we will give you a Dukes Meadows handicap. If you have a real handicap then I will take 1/5th of that for a Dukes handicap. If you would like to come along for some very friendly competition and everyone is welcome then please send an email to stephen.graham@dukesmeadows.com or contact the Golf Pro shop on 0208 994 3314. If you would like a specific tee time between 4.32pm and 6.32pm you only need to specify it!